Labour and Sinn Féin said the date should be changed. 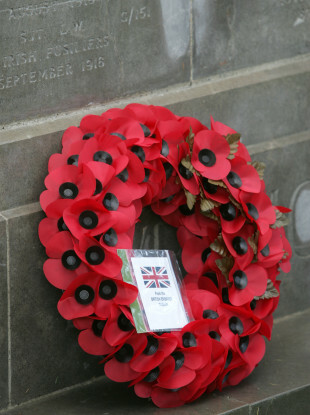 Wreath laid by the British Ambassador leans against the head stone in Glasnevin Cemetery. THERE HAVE BEEN calls for the date of the Presidential Inauguration on 11 November to be changed as it takes place on the centenary of Armistice Day. November 11 marks the signing of the treaty that ended the World War I and is commemorated every year. Every year, a moment of silence is held on the eleventh hour of the eleventh day of the eleventh month to remember those that died in the war that ended in 1918. The Irish president attends a memorial event every year. Speaking about the clash of dates, Health Minister Simon Harris said it is his understanding that it is a “logistical issue”. The current president’s term in office ends on 10 November, therefore determining that the ceremony for the new president is held the following day. “I’m sure the government will wish to reflect on this. I think it’s very important that Ireland continues to commemorate and recognise the participation of Irish individuals in World War I. Many Irish people partook in the war and I think that it’s important that they are recognised and commemorated. I’m, sure that this is something that the government will reflect on further. But I would make the point that there is a logistical issue in relation to the need to inaugurate a president. Labour leader Brendan Howlin and Sinn Féin’s David Cullinane said the date of the inauguration should be changed. Speaking on RTÉ’s News at One, Howlin said the Irish President should be available to stand shoulder-to-shoulder with other heads of states to commemorate the event. Meanwhile, Sinn Féin’s David Cullinane said it is important the whoever wins can attend the annual memorial service. However, he said the “setting of the election and ceremony is a matter for the government”. “If it can be changed obviously Sinn Féin would support it. We have no difficulty in principle to that… [the clash of dates] if it can be avoided, then it should be avoided,” he said. Email “Calls to move Presidential Inauguration date as it will clash with Armistice Day memorial”. Feedback on “Calls to move Presidential Inauguration date as it will clash with Armistice Day memorial”.